Description Bourbon Street Grille is situated on the beautiful Dahlonega square. Located in the historic Hall House building, Bourbon Street Grill boasts full bars and dining areas on two unique floors, which begs the question, “Top or bottom?”. The “top” features an intimate dining room and balcony overlooking the picturesque town square,while the “bottom” has a festive pub atmosphere with flat-screen televisions inside and a pet-friendly deck outside. Our diverse menu offers the perfect meal to go with that perfect seat. From Cajun-inspired favorites like Jambalaya or Gumbo, to delicious seafood such as fresh Apalachicola Oysters or Blackened Redfish, and even that juicy Black & Blue Sirloin or Grille Burger, we have a fantastic dish to satisfy any taste. Join us on the weekends for our fabulous brunch options like Crab Cakes Benedict or our infamously huge Lost Bread. Our knowledgeable staff is happy to help you come up with tasty solutions for allergies and special dietary needs, so fear not, vegans and gluten-free folks! Pop in for a drink, and enjoy our selection of craft beers, fine wines, and specialty cocktails. If you don't have the time to sit down and stay a while, carry-out meals or on-foot delivery to businesses on the square are available. In addition to our great everyday dining experiences, we can help you make your event— big or small— special; ask us about hosting or catering your wedding, meeting, or get-together. We also feature daily specials, live entertainment, and social events, so don't forget to like us on Facebook and and join our mailing list to receive updates! 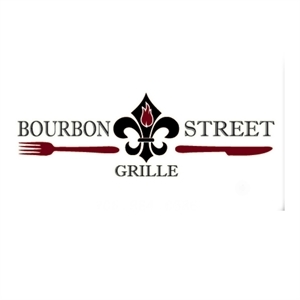 Add Bourbon Street Grille to your free online travel itinerary.